And so, the long wait is over, as Apple has just announced the spanking new Apple Watch – which would be the company’s most personal device (other than the iPhone) to date, and yet offers a new level of innovation to the Apple ecosystem. Basically, this timepiece will be made available on April 24 to those who happen to reside in Australia, Canada, China, France, Germany, Hong Kong, Japan, the UK and the US. The Apple Watch is more than a timepiece, never mind that it is an accurate one, being touted to be an intimate and immediate communication device, not to mention a groundbreaking health and fitness companion. It is highly customizable when it comes to personal expression, where you will be able to embark on a whole new way of receiving information at a glance, not to mention being able to interact with the rest of the world via third-party app experiences which have been specially designed for the wrist. Some of the revolutionary technologies that will come with the Apple Watch would include the Digital Crown, which offers a unique method to scroll, zoom and navigate fluidly without having to obstruct the display. The Retina display with Force Touch on Apple Watch can sense the difference between a tap and a press, which in turn provides a new method of quickly and easily accessing relevant controls. This is made possible thanks to the all-new Taptic Engine. The Apple Watch is said to be able to keep time to within 50 milliseconds of UTC, which is the universal time standard. You can also personalize Apple Watch with watch faces ranging from traditional analog such as the Chronograph face, to the information-rich Modular face, or beautifully animated butterflies and jellyfish on the Motion face. It is a whole lot more than just telling the time for sure. 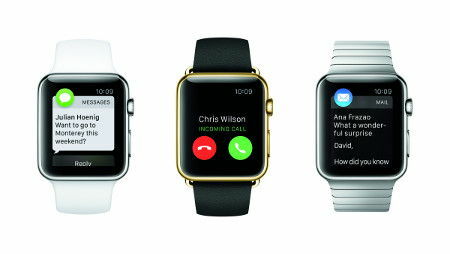 There will be three collections to choose from – the $349 Apple Watch Sport, the Apple Watch which will retail from $549 to $1,099, and for those with plenty of money to burn, the Apple Watch Edition that has been crafted from custom rose or yellow 18-karat gold alloys with prices that start from a whopping $10,000.